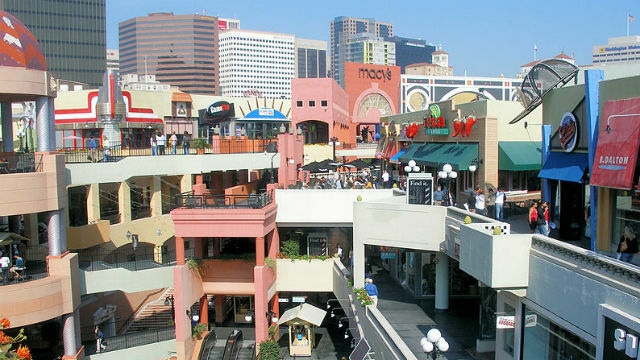 A Los Angeles real estate investment firm announced Friday the completion of its acquisition of Horton Plaza and plans to redevelop the downtown San Diego shopping center. Los Angeles-based Stockdale Capital Partners plans to transform the 900,000-square-foot plaza into The Campus at Horton, a mixed-use retail and creative office complex. The shopping center opened to great fanfare in 1985 and helped transform downtown San Diego, but has been in decline for a number of years. The redevelopment is expected to generate more than $1.8 billion in annual revenue and create between 3,000 and 4,000 jobs, according to the firm, which did not disclose terms of its purchase of the center from mall owner-operator Westfield. “We’re excited to create an iconic destination that will leverage the best of downtown San Diego to create something high impact and truly unique,” said Steven Yari, Stockdale’s managing director. “The Campus at Horton will be a thriving innovation hub, comprised of creative office space, captivating entertainment options, urban lifestyle retail choices and contemporary food and beverage experiences, catering to leading technology and biotechnology employers, locally and national,” he said. Initial plans call for a boardwalk with boutique retail, green space and public seating areas to run through the site and spill out onto a rejuvenated Horton Plaza Park, which would offer a variety of local food and beverage option. Stockdale plans to partner with the city, the chamber of commerce, the Downtown San Diego Partnership and the San Diego Regional Economic Development Corporation to host a series of forums to gauge feedback to the project from residents. “I strongly believe that The Campus at Horton, and similar projects coming online, can redefine the future of Downtown San Diego,” said Betsy Brennan, president and CEO of the downtown partnership. Stockdale is aiming for a groundbreaking in early 2019, with the project’s completion slated for the fall of 2020.